Since the 1960s, poetry in French has been understood in terms of two competing approaches: searching for 'presence' on the one hand, 'littéralité' - refiguring the everyday - on the other. Contemporary forms of both are found in this anthology, from the 'new lyricism' of Bonhomme and Maulpoix to the refracted politics of 'post-poetry' in Tarkos and Gleize. The dichotomy, however, quickly breaks down and many poets refuse to be categorised in this way: recent publications include the interdisciplinary and collaborative work of poets such as Alferi, Chaton, Game and Macher; the focus on formal constraint in Métail and Espitallier; Portugal's exploration of the impact of new technologies. 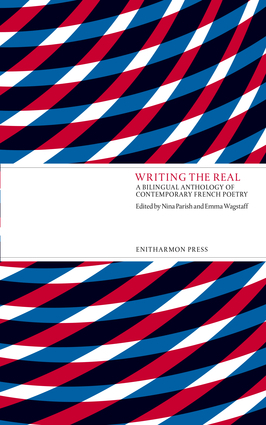 Writing the Real features 18 key contemporary French-language poets alongside English translations by leading poets and translators. Since the end of the Second World War, there has been relatively little dialogue between French and British poetry. Featuring some of the leading Francophone and Anglophone poets of our time, this anthology looks to challenge that trend. Nina Parish is a Senior Lecturer in French Studies at the University of Bath, UK. Her research interests include twentieth and twenty-first-century French literature and the visual arts and in particular modernism, the avant-gardes, modern and contemporary poetry (including digital practice) and the artists book. She has published a monograph (Henri Michaux: Experimentation with Signs (Rodopi, 2007)) and various articles on these subjects. With Emma Wagstaff (see entry below), she co-edited, alongside Hugues Azérad and Michael G. Kelly, Poetic Practice and the Practice of Poetics in French since 1945 (spec. iss. of French Forum, 37, 1-2 (2012), and Chantiers du poèmes : Prémisses et pratiques de la création poétique contemporaine (Oxford: Peter Lang, 2012). From 2012 to 2015, Nina Parish and Emma Wagstaff organized an international research network, funded by the Arts and Humanities Research Council, on interdisciplinary connections in contemporary French poetic practice. Emma Wagstaff is lecturer in French at the University of Birmingham, UK, where she specializes in modern and contemporary French poetry and the connections between literature and the visual arts in the modern period. She has published various articles on these subjects, as well as Provisionality and the Poem: Transition in the Work of Du Bouchet, Jaccottet and Noël (Amsterdam: Rodopi, 2006) and Writing Art: French Literary Responses to the Work of Alberto Giacometti (Oxford: Peter Lang, 2011).